Comments Off on Why a glass is top preferred for a dining table?? Why a glass is top preferred for a dining table?? 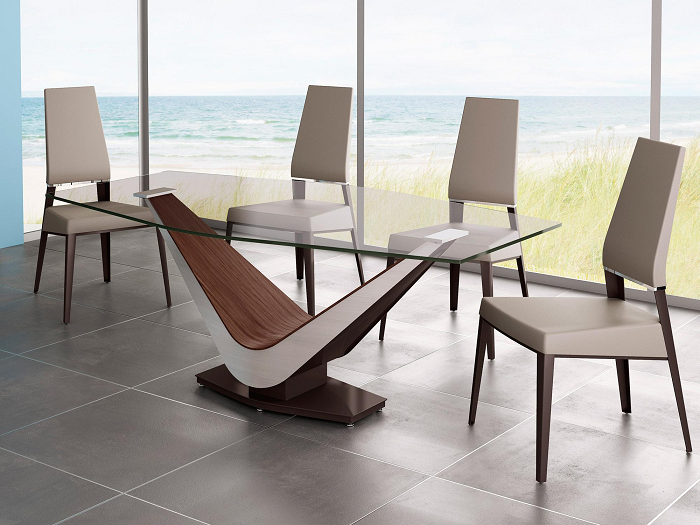 Dining table set is a very important furniture of your house. Without the dining table set, the furniture of your house are incomplete. It is very important to choose the right color of the wood, the tabletop and the design of your dining table though it is very small furniture. This will complement the existing decor of your house and the color of the walls. So the important part is choosing the right dining table so it should need some kind of thought and planning. Everything is about having the right furniture at the right place. You should start by choosing the shape of the dining table. For this, you have to gauge the space available at your dining area. Dining tables come in various shapes, mostly oval, round, square and rectangular. Depending on the number of members your family has, select the size of the table and look at the number of chairs it is coming with. The lightings and the curtains you arrange for the dining area also have a great impact on the mood of the people spending time there. The dining tables come with two types of tabletops, one is wood and the other is glass. People nowadays prefer glass tops instead of wooden tops because glass tops make the room look big and also gives an elegant touch to the room. Glass tops goes very well with the modern day decor and furniture. They also complement any type of wall colors. If you have a wooden top dining table, you can place a glass sheet on top of it to give it the elegant look. Most importantly, glass tops save the wood underneath from the moisture it receives from everyday table usage and this also gives a contemporary look and feel to the room. Why a glass is top preferred for a dining table?? 0 out of 5 based on 0 ratings. 0 user reviews.